You know how I said in my last post that I would be doing more than just reviews? Well, as I was brainstorming my second post, it just so happened to be a review that my brain settled on. I do hope that's all right with you. I just had to talk to you all about the book I finished reading several days ago. In case the title didn't make it obvious enough, I am reviewing Peter Nimble and His Fantastic Eyes by Jonathan Auxier! You may have seen this book and decided not to read it because it is a middle grade fantasy, and you are not of the middle grade age. Or perhaps you have never seen it, and now your curiosity is piqued. Well, I shall tell you all you need to know. But first . . . SPOILER ALERT! There will be no spoilers in this review. Now that the obligatory spoiler alert is out of the way, let's begin! 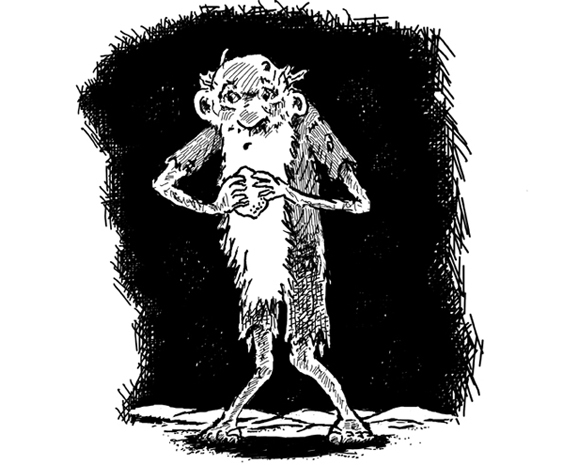 Ten-year-old Peter Nimble is a thief, and a devious one at that. He can pick virtually any kind of lock, sneak through a room without you noticing, and deftly escape any would-be captors. You might be tempted to call him the perfect thief. He also happens to be a blind one. Orphaned as a child and taken in by the cruel Mr. Seamus, he is forced to steal every night. That is, until a mysterious man gives him a box that contains three pairs of eyes--Fantastic Eyes, more specifically. He puts one pair on and is transported to an island. There, he finds out about the Vanished Kingdom, where things have gone terribly wrong. With the help of his new-found friend, Sir Tode, Peter shall venture to this kingdom in order to save it. But many dangers lurk along the way, and all of his skills as a thief will be put to the test if he wants to survive and become a hero. While the essential plotline isn't necessarily new, it's told in a creative way. The Wall Street Journal describes the book as "part hero quest" and "part orphan saga." This will probably give you some indication as to the flow of the story. What Auxier does well is add creative elements into it, like a blind protagonist (which I've never thought of doing), clockwork machinery, eyes with magical properties, etc. It helps keep the story fresh, even if we've read books like this before. The characters are all creative, I must say. Aside from the blind Peter, we have Sir Tode, a loyal companion who used to be a knight. When he and his horse argued with a kitten (yes, you read right: he argued with a kitten) outside a witch's home, she carelessly cast a spell that combined the three. So Tode is a knight in a cat's body that has a few horse features, such as hooves and those pointy horse ears. And he has a fabulous mustache. And he can talk. Pretty unique, I say. A thief by the name of Poor Old Scabbs offers crazy pieces of dialogue, especially since he refers to himself in third person. There are other talking animals, such as fish, birds, and apes. I shouldn't really mention any more characters, since I promised not to spoil anything, and most of the interesting characters involve spoilers. The setting also is unique, partially due to the fact that it's very ambiguous. When I started reading, I thought the book took place in London during the 1800s or something. However, once Peter teleports to a hidden island, sets out for the Vanished Kingdom, and lands in the Just Deserts, I figured this was probably set in a made-up world. I only really thought that was the case by the time I reached the end of the book. There are different examples I could use, but again, no spoilers. I loved Auxier's whimsical writing style. It made it feel like I was reading a new classic, if that makes sense. And Auxier was brave enough to do something not many would: he intentionally broke the rules. What I mean by this is that he snapped out of the POV to offer a piece of information that would otherwise be unknown by Peter, or he'd insert witty aside. At one point in the book, Auxier writes, "If you have ever had the chance to spend quality time with a villainous mastermind, you will know these people are extraordinarily fond of discussing their evil schemes out loud." Comments like these can be hard to do--and shouldn't always be done either--but when they're done right, they are great additions to the story and are a testament to a delightful writing voice. I was able to guess all the major twists in the book ahead of time; while you may not foresee them, don't go into the book expecting to be surprised by phenomenal plot twists. For this book, it wasn't a huge deal for me, but . . . just a fair warning. There are a few uses of the British word "bloody," which I didn't find offensive, but some people might. There was one point in the book where Peter suddenly feels various things, such as tiredness. While this can happen, to me, it would've been more logical if there had been something leading up to this. For example, if Peter had noted being tired a few times before, I would've been okay with him being suddenly overwhelmed by it. I feel like some of the characters could've used a little more depth or been rounded out a bit more. Doing so would've added just a little more oomph to them. This could very well just by my personal preference, but I figured I'd mention it. What took me by surprise the most was some of the violence in the story. After all, this is a MG fantasy, right? How bad can it get? For the most part, it was vague, but there were a few moments where it stood out. For example, a character is pecked to death by ravens, and said character is only the first victim. Armies clash on a few occasions, causing much blood to flow. Someone gets a knife to the heart. Another character is beheaded. Burning coal is dropped on heads. The final confrontation is possibly the most violent scene, but to explain it would be spoilery. Suffice it to say it was very unexpected and wince-worthy. To sum up, I think this book was surprising and yet not surprising. Surprising because I didn't expect to fly through it as I got caught up in the plot and the characters. Not surprising because I foresaw the twists, which were still good additions to the plot. What was most surprising was the violence. I think the reason for that is because it's MG, and so I had no reason to expect those moments. It shocked me more because of younger kids who might pick up the book and encounter these sudden violent scenes. The rest of the book suits the MG audience, but I thought the violence was more at home in a YA book. In the end, though, I loved the book and would recommend it to anyone wanting a quick summer read/hero story. To more sensitive readers, I would caution them to put down the book if they get uncomfortable. And while there were some flaws, I can forgive them since this story is Auxier's debut novel. I expect excellence more than I do perfection, and for the most part, I found it to be of excellent quality. 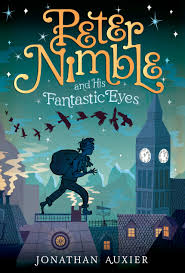 I deem Peter Nimble and His Fantastic Eyes to be worthy of four stars! I haven't heard of this book, but it looks like an interesting one to try sometime. I love the idea of a blind thief and a knight/cat/horse/thing. I will NEVER complain about review posts. I love reviews!!! ANYWAYS. This book looks really, really fun and I need to give it a try sometime! Younger readers probably wouldn't the predict the plot as much. Yep, it's always to get away from the general heaviness of YA and read something a bit lighter. ANYWAY. Like Christine mentioned, I love quirky books with odd characters, so Sir Tode and the Scabbs guy sound hilarious. Well, Poor Old Scabbs isn't a major character in the story, but he is rather quirky. Sir Tode was quite interesting as well. Sounds cool! Good review too! I like having the pros and cons like that. Nice book review, bro! :D You did totally nail it. XD Reading this review makes me want to re-read the book again.